Select one of the Variants. Select the Transition to This Slide and the Effect Option if applicable. You can also set the Duration of the transition and select Apply To All to apply the transition to all slides. If you're working in PowerPoint Online and need more advanced features, like PowerPoint Designer, you can switch to PowerPoint 2016 on your desktop. Open PowerPoint 2016, select File > Open, and select the file you want. Go to the OneDrive folder on your computer and select the file you want. With a file open in PowerPoint Online, select OPEN IN POWERPOINT to launch the desktop app. When you save, your changes are synced to your OneDrive or SharePoint site. 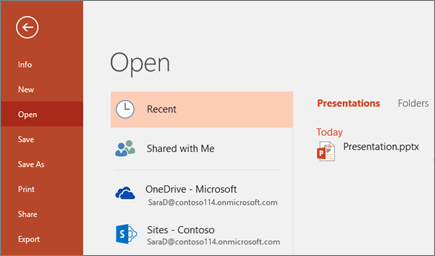 In the OneDrive app, select Files or Recent and then select the file you want to open. In the PowerPoint app, select Open, select the location and select the file. Or select Recent and select a recently opened file. 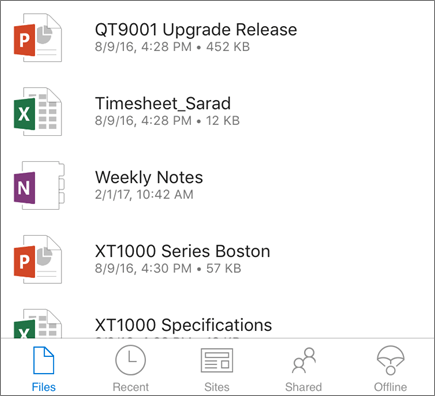 If you need to install the apps, see Set up Office apps and email on a mobile device.